Wedding Planning Help for the perfect Rochester Wedding! 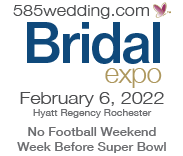 Helpful wedding planning articles and tips to assist Rochester area future brides in planning the perfect Rochester wedding of their dreams. Find inspiration, tips and advice from 585wedding.com's helpful wedding planning articles. Articles will be added regularly so check back often to keep up with all of the helpful tips and articles. Articles pertaining to bridal fashions and accessories.